With Thanksgiving approaching with big steps, there is more to worry about than how to perfectly cook dinner. I am talking, of course, about Thanksgiving crafts for kids. These have to tick quite a large list of criteria: it’s immensely fun when they are edible, but it’s budget friendly when they are free to make. In addition, they must be easy and equally entertaining, but the final result also has to look cool. But hey, no pressure. Pinterest offers a ton of quirky ideas that are quick to make at home with simple instructions. Ready to engage the creativity of your kid with some fun projects? Get some inspiration from our activities that are bound to capture the attention of both children and adults. Ready, set, go! Suitable for children of all ages, this little project is easy to carry out in three steps. You’ll first need to remove the paper cup’s top ring, making two holes in the top side and on in the center bottom. Feel free to paint the ring in a color of your choice. Depending on the material of the ring, you can use spray paint, nail polish or even a sharpie. Next up, take a piece of cord. 20 to 25 inches will suffice. String a single bead on each end of your chord, making two loops and putting them through the top holes. Follow up with a couple of wooden beads on the cord in order to create a Y shape. Now you’ll want to push the two cords through the bottom hole, securing everything in place with a bead. For the final touch, tie a feather and add a bead to the cords. Not only will this project make for a cute centerpiece for your Thanksgiving table, it will also leave you with several unique placemats that you can reuse any time of the year to make your food look more interesting. The tools needed for this activity are minimal: a large plate, a piece of scrapbook paper, a sharp pair of scissors and glue. The first step is to place a large plate on the scrapbook paper and trace the outlines. Cut the circles with a pair of scissors. Don’t worry if it doesn’t look perfect at this stage. The borders of your circle will be covered in feathers. The next step is gluing the feathers to your paper support. You can leave the center of the circle blank since it will be covered up by the plate. Glue the feathers so that they stick out from the scrapbook papers and create a uniform design. You can play with the colors or use the same shade all over. If you want to roll up your sleeves and feel like Martha Stewart for half an hour, help your kids carry out this fun activity. They’ll enjoy all the steps and you’ll be left with thoughtful gifts for your family members and friends. It’s never too early to teach children about gratitude, so why not do it via arts? Instead of using pricey printable notecards, here is how you can make your own version. Go outdoors and look for either oval or round leaves. These will become the pattern on your notecard, so you want to take the time and choose leaves that have nice, unique shapes. Keep an eye out for leaves that will resemble pumpkins. Once you find one or more leaves you’re happy with, paint one side using orange poster paint. Then, apply it onto a piece of construction paper, just like you would a seal. Remove it with care, since the paint can still be wet and it can ruin the design. Use a small brush to draw a stem and allow your notecard to dry. When it’s completely dry, fold the paper in two and write something thoughtful inside. Carving pumpkins is for Halloween, and designing pumpkins is for Thanksgiving day. This fun activity is suitable for older children who have steady hands and have a hang with spray painting and sticking tape. It’s easy to customize almost anything with these techniques, so you don’t have to limit yourself to pumpkins. For the sake of the example, let’s take a look at this pumpkin that was decorated with simple white paint and gold accents. To achieve a nice effect, choose different sized pumpkins. Make sure they are clean before you start the painting process by wiping them with a damp cloth and removing any dirt. You want to make sure the paint won’t have any trouble sticking on uniformly. Cut out the shapes of your choice or use pre-made stickers: circles, squares, flowers or pumpkins will look adorable. Press the stick-ons onto your pumpkin to create the desired pattern. Use acrylic paint to cover the whole pumpkin and let it dry as per the paint’s instructions. When it’s completely dry, gently peel off the tape and bask in your gorgeous design. Maracas are fun to enjoy all year round. And it’s double the fun when you can make them yourself. Here are all the steps you have to follow to help your kids make their own. Use plastic Easter eggs or any other round recipient that you can fill. Kinder eggs will work wonderfully. Fill up the plastic eggs with rice or dried beans. Allow your kids to experiment with the amounts and the fillers, and see if they notice a difference in the sound they each make. Once the eggs are filled up, place it between two plastic spoons. 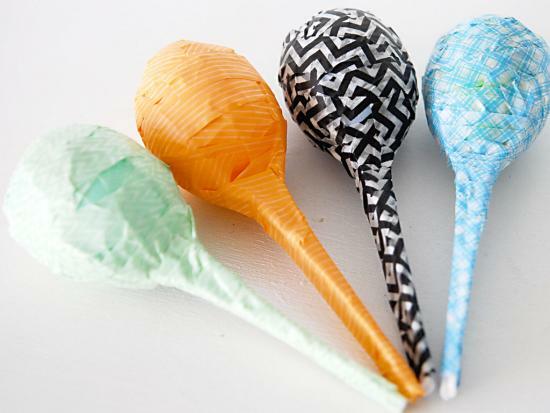 Secure the spoons with enough tape to keep everything in place when you are shaking the maracas. For a colorful, vibrant effect, choose a fun wash tape and cover the spoons in it. Don’t forget the handle. Not only will the wash tape make everything blend in and look homogenous, it will also keep everything in place and ensure hours of play and fun. Remember those edible projects I mentioned above? This DIY will keep your kids hooked and give them the chance to snack on gumdrops. The supplies are flexible, depending on how you want your gumdrop turkey to look like. You will need a large gumdrop, six to seven toothpicks, seven small gumdrops, a gummy worm and a marshmallow. The first step will be creating the feathers. This implies attaching the small gumdrops to the toothpicks (feathers and tail), which, on their turn, will be attached to the big gumdrop (the body). Choose a medium sized gumdrop and cut it in two in order to create the wings of the bird. Attach them to the body. Use the marshmallow to create the tiny eyes of the bird and stick them on a dark colored gummy drop (the head), adding candy nerd into the center of the eyes. For the beak, choose yellow candy, cutting it in the right form and use a red chunk of gummy drop for the snood. Attach the head of turkey to the bird by cutting a toothpick in half and sticking it to the main part. 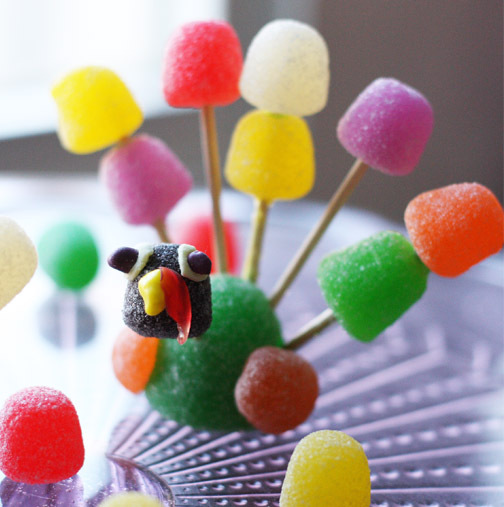 One of the most appealing Thanksgiving crafts for kids, gumdrop turkeys are fun, quick and require a minimum of supplies.